As Larry Williamson sees it the problem with compressed earth blocks is that they are too small. They are so small that they have to be laid by hand. Laying by hand means hiring laborers and hiring laborers means liability. It also slows down the process of building. So, several years ago he began working on a machine that would produce compressed earth blocks that would be large enough to place by machine, blocks so large that a single one could run the length of a wall. He received patent number 7311865 for a Block Ramming Machine on Christmas Day 2007. He has numerous other patents for his machine pending. His prototype machine produces blocks that are 12 inches high, 18 inches thick with a length as long as you want. It takes 15 minutes to produce a block that is ten feet long. His next machine will produce two blocks in that time by putting otherwise idle hydraulic fluid to use in a second compression chamber. 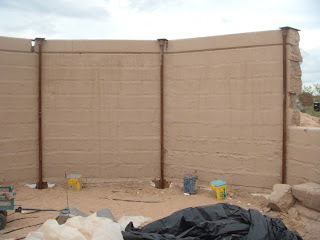 Mr. Williamson, like Lawrence Jetter of AECT, is an advocate of placing unstablized blocks directly into walls and allowing them to cure within the wall, though his machine can also produce lime or portland stabilized blocks. By taking the blocks directly from the machine to their final resting places in the wall a structure can be dried-in extremely quickly. Placing a block takes one and a half minutes. 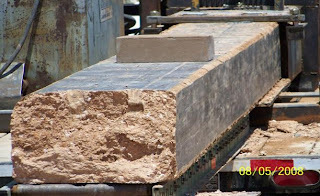 Once it is placed, measurements can be taken to determine the length of the next block to be produced. The machine extrudes compressed earth blocks in four inch increments. The blocks can be trimmed as needed. He says that when the blocks come out of the machine they are somewhat flexible like PVC pipe, but his lifting and carrying devices move them safely without damaging them and allow precise placement of the blocks which weigh well over a ton. In developing his machine he has been assisted by students and staff from the Texas Tech Department of Engineering. He hopes that major manufacturers of earth moving equipment will license his designs and produce machines that can then be leased to builders. Since the walls can be created quickly, the heavy equipment is only needed a short time at each building site. The machines were used to build an environmental center at Rio Blanco Girl Scout Camp in Crosbyton, Texas and Williamson is fielding inquiries from builders and non-profits interested in experimenting with his technology. In the video below Larry Williamson demonstrates the machine and talks about uses for the blocks in highway construction. Compressed Earth block is an effective building system in energy conservation and green technology, but presents problems in financing the actual construction, for the average individual. Most banks require a comparable home within a 10 mile radius when financing and the banks are afraid the project will go into default if taking too long during the construction proccess. If anyone knows a mortgage company that will finance this type of construction please let me know. I have been trying to get approved for CEB construction all year long and have gone to several finance companies.